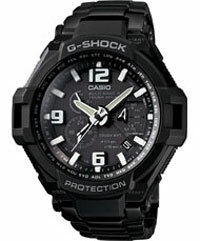 Casio GW4000D-1A.Can accurately display the time, is a trusted watch flight competition, even in harsh environments. Can accurately display the time, is a trusted watch flight competition, even in harsh environments. Follow the GW-3000 anti-centrifugal force construct the dial and dial connections using the new shock structure. And the development of new aviation movement around in the movement to install insulating materials absorb vibration, can protect the internal movement not affected by vibration, anti-vibration purposes. Strap and dial-in connection, the use of special plastic material, to prevent the screws loose in the strong vibration.